Summer is in full swing now. Make sure you and your home are prepared for the blazing heat, unpredictable weather and summer-loving bugs. Now's the time to make sure your air conditioning is in perfect working order. If you test your HVAC system today and find out it's not functioning properly, you need time to come up with a solution before the weather gets unbearable. ...set a thermometer on the supply register that's closest to the inside cooling equipment. Keep it there for five minutes and note the temperature. Do the same thing at the return vent. The air coming out should be [6 to 10 degrees] than the air going in. An air conditioner that's not cooling to those levels could be low on refrigerant or have leaks. A unit cooling more than [10 degrees] could have a severe blockage. If your unit isn't working properly or efficiently, it might be time to call in a professional. They will test the unit itself and test your air ducts for any potential leaks. If you don't already have a programmable thermostat, now might be a good time to bite the bullet and invest in one. Depending on how often you use your air conditioning in summer, you can cut your electric bill quite a bit. If your AC unit is more than 15-20 years old, you might consider replacing it with a more energy-efficient, Energy Star unit. If you're installing a window AC for the first time, it's probably easiest and safest to call in a professional. If you want to DIY, the instructions will vary depending on the unit and what kind of window you're working with. Generally, though, you'll have to install extensions around the unit, fasten it down with brackets and with the upper window pane, then fasten the extensions and seal the unit. Here are more detailed instructions. Your air conditioner is functioning efficiently — great! If you have leaks in your home, though, it doesn't really matter, because that perfectly cooled air is slowly leaking out. You can call in a professional, but it's simple enough to conduct your own home energy audit first. First, look for actual leaks: drafts in your windows and doors. If you do find any leaks, you can seal them up with caulk and weather stripping. Speaking of windows, MyHomeIdeas suggests a few additions to keep them cool: reflective film, sunscreen-fabric curtains, roller shades. If you have an attic or basement in your home, check the insulation; it may have compacted over the years, which means it's not covering everything it should. Check your insulation for leaks and gaps. Former Lifehacker contributor Timothy Dahl suggests you look around pipes and ductwork, specifically, and fill those areas using expanding foam. You should also make sure the attic floor is insulated without blocking vents. When it comes to adding large amounts of your own insulation, keep in mind: it can be a pretty messy job. For the most part, many bugs and insects go into some form of hibernation during the colder months. Other insects migrate someplace warm to wait out the colder months. Still others decide the best way to stay out of the cold is to camp out in your home. You may see more bugs in your house in the winter months, although many of them make their homes inside walls and attics where you are unlikely to encounter them...The minute it starts warming up, the bugs of summer will begin to flock to your area. In my old apartment, we'd get an influx of ants every year. If you don't have a landlord to take care of pest control, or you just want to do it yourself, there are a number of ways to keep bugs from coming in. First, make sure everything is properly sealed. And if you checked for leaks, you've already done this. Check the caulking around your windows and doors, then fix any drafts or gaps with new weather stripping and caulking. Spray your outdoor perimeter with a pesticide, along with baseboards, sinks, windows, and doors. Read all the applicable warnings on the pesticide and make sure your pets don't get into it. It's easy enough to make your own DIY natural repellant, and Apartment Therapy offers a simple solution here. Yes, your ceiling fan is designed to rotate differently depending on the season. In winter months, it should rotate clockwise to help distribute heat that's risen. In the summer, though, you should run your fan counter-clockwise at higher speeds to get a breeze going. 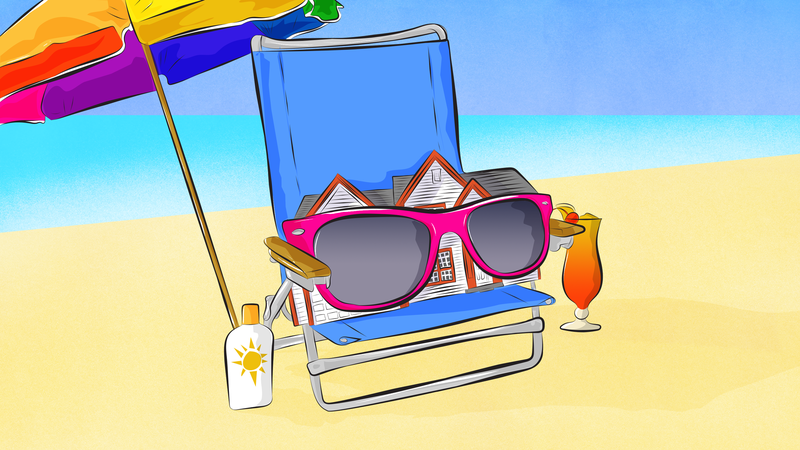 Summer weather isn't just hot and sticky. It can also be stormy and, sometimes, dangerous. For example, cyclone season hits in the summer months, and with it often comes flooding. Make sure your house is protected. Again, make sure your windows and doors are properly sealed and caulked, too. You should also test your gutters. Turn on your garden hose and place it inside the gutter so water begins to run. Then, walk around your home's perimeter and check the gutter. Look for water coming out of any places it shouldn't. You should also check your gutters for dips or sags where water might pool near your house. Now is the time to make a few changes around your home to prepare for the extreme weather. With a few tweaks and inspections, it's easy enough to make sure you're in good shape by the time summer arrives. Bit late for this advice. You should have posted it back in November. Thanks LH, really nailed the timing on this one. Bit flamin' late for this article don't you think? *sigh* another case of copypasta an American article into the Australian site. How about some original content?